The first half of the Lent term for me is full of Parents’ Evenings. I had two Year 8 Parents’ Evenings last week, and I have a Year 6 Parents’ Evening next week. These events are usually fine; yes, I probably would rather be at home with my wife, but there is something quite nice about being able to sit down with the parents’ of one’s pupils and discuss their son or daughter’s progress with them. This is especially true if their child is performing well, but is even the case if they are not; Parents’ Evenings are a great opportunity to discuss potential problems and work on a resolution. It is always fun, too, to watch pupils’ faces as they sit down; they are usually well aware of if they are about to receive high praise, of if the interview is going to be a little more awkward for them. It is an absolute delight to watch the faces of pupils who receive praise; they are so happy to be told that their teacher is pleased with them and that they are doing well. 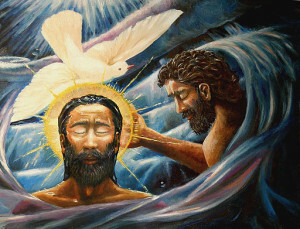 In the verses above we witness the moment when Jesus was baptised by John the Baptist. John baptised him with water for repentance, even though he knew Jesus to be entirely free from sin and blameless in the eyes of God. He pushed him beneath the waters of the river Jordan, which represented cleansing from sin, and rebirth into God’s kingdom. As Jesus was symbolically ‘born again’ and came up out of the waters, three incredible things happened. Firstly, ‘heaven was opened’. The borders between the kingdoms of Earth and God’s heavenly kingdom, which had been closed since the fall of humanity were reopened. Jesus was installed as God on Earth, as Immanuel, as he began his work to draw humanity back to God and enable humankind to enter God’s kingdom. This foreshadowed the work that would be completed by Jesus’ death on the cross on Good Friday and his subsequent resurrection on Easter Sunday. Secondly, the Spirit of God, taking on the appearance of a dove, descended from heaven and landed on Jesus. Jesus had always been both fully God and fully man, a consequence of his parentage, but at this point, in case there was any doubt at all, the Holy Spirit anointed Jesus as the one sent from heaven. Finally, God proclaimed from heaven, ‘This is my Son, whom I love; with him I am well pleased’. God the Father identified Jesus as his son, declaring that Jesus was indeed the Messiah that had been promised through the ages. The Messiah was not merely a representative of God, however, as many had thought. The Messiah was in fact the son of God, God born into the world as a human being to live and work amongst us. The message of love, of hope, of eternal life was too important and too earth shattering to be entrusted to any ordinary human being; the message that God wants his people to hear is so important that he sent his son to preach the Gospel. Not only that but God so desperately wanted to restore humanity to its pre-fall condition that he was willing to sacrifice his only son to redeem the world. And God knew that Jesus would do this, and do this well. He did not need to wait for Jesus to act in order to lavish praise upon him. God did not love Jesus for anything that he had done, but for the simple virtue that he was his son. At the time of his baptism, Jesus had yet to perform miracles, heal the sick, teach the crowds, and certainly had not yet been nailed to the cross, died, and risen to life again. Yet just for being his son, God was proud to state that Jesus was his own and to declare his love for him. Unlike my pupils who I tend to praise after the event, God praised his son right at the start of his ministry. There is so much for us to take in within these two simple verses. We see Jesus identifying with us in our sin, and choosing to be baptised. We see Jesus anointed by the Holy Spirit as the Son of God. And we see God proclaiming his love for Jesus, a love based solely on Jesus’ identity, and not on his actions. We begin to see the Trinity of God at work. There are important lessons for us, too. If Jesus, free from sin as he was, chose to be baptised, we should take this rite very seriously, and if we have not been baptised, consider whether this is something we should do. If we have been baptised we are reminded of the importance of our baptismal vows, that we have renounced sin and turned to follow Christ. Do we live in a way that reflects this? Finally, do we love our families, our friends, and our fellow people simply because of who they are, or do we base our love solely on their actions? True, unconditional love has no limits or restrictions. What an important reminder that is this morning!